Motherhood is fulfilling and makes you happy. Saying anything to the contrary means you are egoistic and uncaring or not quite normal. When she published the first results of her study Regretting Motherhood, the Israeli sociologist Orna Donath set off a world-wide debate that is still in its early stages. In her book, she looks at the correlation between the social dictate of motherhood and the hitherto rarely expressed feelings of regret voiced by mothers. 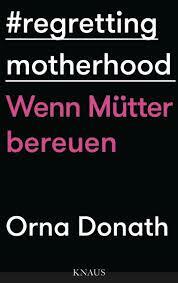 “A woman must still be allowed self-determination when she has children”, says Orna Donath, thus giving feminism a decisive impulse.